Yesterday I drove the Denali Highway between Paxson and Cantwell. It’s 134 miles of gravel road. The first 12 or so are paved but after that it is a gravel, washboarded highway. Most of the time I was driving 25-30 miles an hour. Sometimes because I was looking for wildlife and others because you just couldn’t drive a whole lot faster. I didn’t see any bear along this road but I did see lots of caribou. Caribou are hard to photograph because they are very skittish. They head for cover when you see them on the road. Then you can’t find them when you slowly move up to where you think they went into the bush. Here are a variety of scenes I shot along this stretch of road. Bear in mind it was rainy and overcast all day. 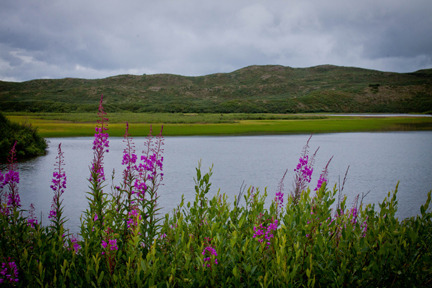 The flower in the foreground is fireweed. The story is that when the bloom reaches the top then summer is over. 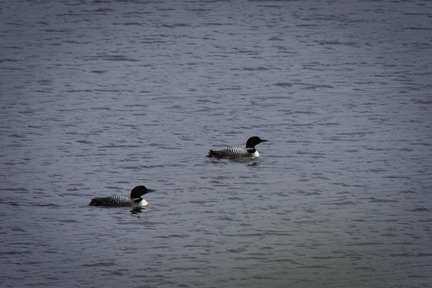 Here are a couple of shots of some loons on another lake. While I was shooting these an eagle circled and was planning on making lunch of one of these loons. 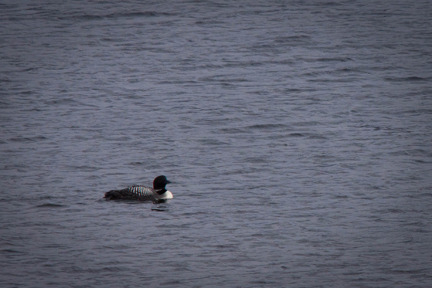 The two loons made all kind of weird noises and ducked below the water and the eagle moved on for the time being. 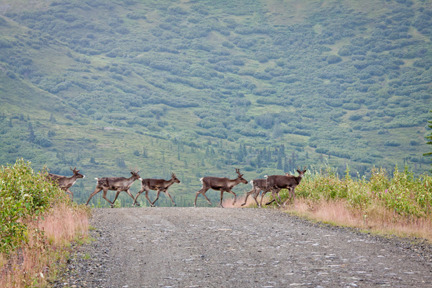 I first saw this group of caribou in the tundra moving down a trail but couldn’t get a clear shot. 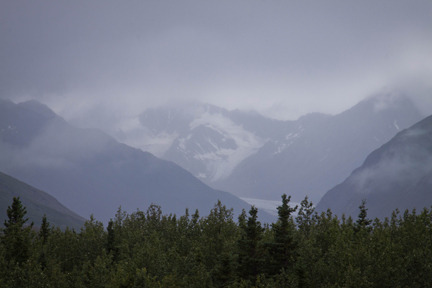 I had pulled off onto an old mining road and was about a mile off the Denali Highway at the time. I moved up the road a ways and waited, hoping that they would eventually cross the road. And they did. Finally, in Texas they still heard cattle by horseback and some ranchers use helicopters. 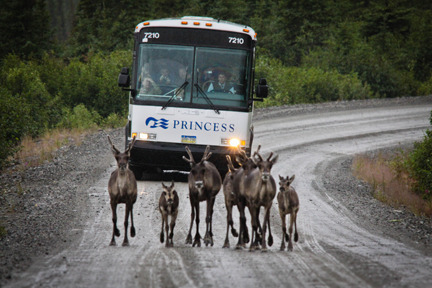 I’ve never seen a round-up done with a tour bus but this one is moving seven caribou down the road right toward me. I took a number of shots before they eventually moved off down a trail. Now, I’m going to try and sell this shot to Princess Cruises for their brochure. Maybe they’ll help pay for that transmission I replaced in Wyoming. I met a local at the library this morning while I was using the wi-fi and he suggested a road up into the mountains that would provide me with some great scenery. I’m going to go look for it. I’m waiting for the weather to clear (?) for a flightseeing trip over Mt. McKinley. Hopefully, that will happen in the next 48 hours. More later…..